When Laura Fedy walked across the stage on June 14 at Laurier’s Faculty of Science convocation ceremony in Waterloo, she did so with a strong sense of purpose. Laura has spent the majority of her undergraduate degree learning, teaching and researching concussions, an injury to the brain that is still surrounded by misunderstanding in the science community. Laura’s work has already garnered headlines locally, but this fall she will be stepping onto the international stage. In October, Laura will travel to Berlin, Germany to present her research at a conference alongside her supervisor, Laurier Associate Professor in Kinesiology and Physical Education Michael Cinelli. Laura found her passion quite accidentally. She answered a call for volunteers from TeamUp Against Concussions Laurier and discovered the world of myth that surrounds concussions. Determined to shed some light on the highly controversial injury, Laura focused her undergraduate research and fourth-year thesis on the topic. Working alongside Cinelli, Laura dove into the current research around concussion recovery and rehabilitation. Cinelli’s research already focused on balance recovery after concussions, so Laura dug deeper into existing research, but found a huge gap in the findings. Her research examines two aspects of concussion recovery: does balance control recover at 72 hours and correspond with symptom recovery, as current research states, and what are the best tools to determine balance control recovery? Their study made it clear that balance wasn’t guaranteed to recover with symptom recovery. Another challenge was in the assessment of balance recovery. Currently, clinics aren’t equipped with the kind of technology that accurately assesses an individual’s balance. Clinicians are often left to determine subjectively if balance control has been regained, leaving a huge gap in the consistency of treatment. The solution is complex and one that Laura is determined to lead. 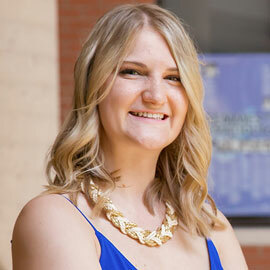 Laura credits Laurier’s small, intimate campus for helping her find her passion. Laura and Cinelli will attend “The Fifth International Consensus Conference on Concussions in Sport,” Oct 27-28 in Berlin, Germany. Laura will present a poster of her research, which will be published in the British Journal of Sports Medicine. She will continue to work on completing and publishing her paper, while also applying to graduate school in 2017. Read more on Michael Cinelli’s research.